Masato Hoshino, MD, Abhishek Sundaram, MBBS MPH, Arpad Juhasz, MD, Tommy H Lee, MD, Sumeet K Mittal, MD. Department of Surgery, Creighton University Medical Center, Omaha, Nebraska. 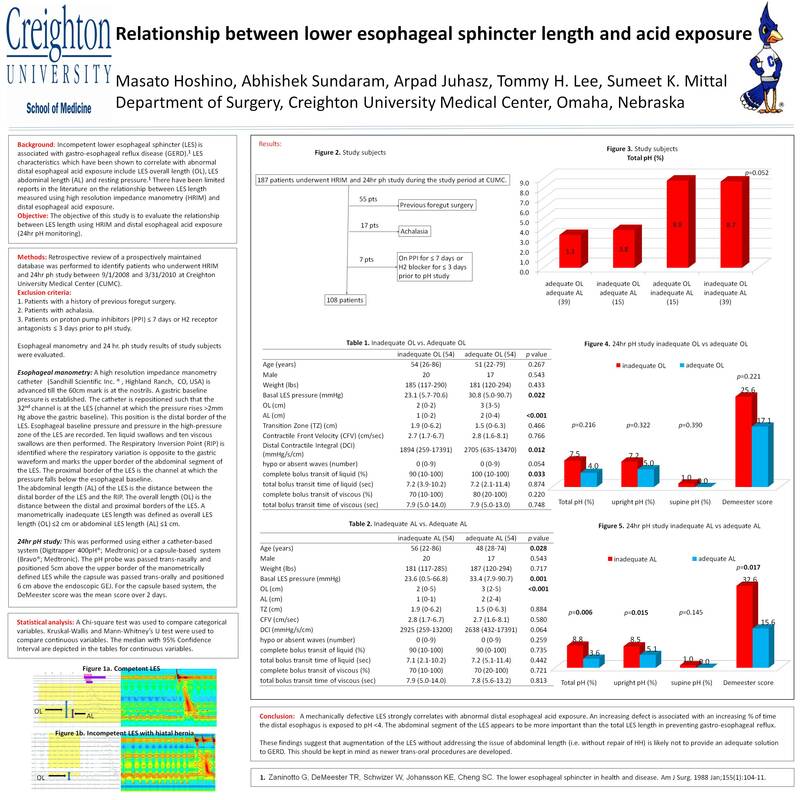 Introduction: This objective of this study was to evaluate the relationship between lower esophageal sphincter (LES) length and and acid exposure with the aid of manometry and 24hr ph monitoring. Methods: Retrospective review of a prospectively maintained database was performed to identify patients who underwent HRIM and 24hr ph testing between 9/25/2008 and 3/25/2010 at a single center. Patients with achalasia and a history of previous foregut surgery were excluded. A manometrically inadequate LES length was defined as overall LES length ≤2 cm or abdominal LES length ≤1 cm. High Resolution Impedance Manometry (HRIM) tracings, conventional manometry tracings and 24 hr ph study results were evaluated. Chi-square test was used to compare categorical variables. T-test and Mann-Whitney tests were used to compare continuous variables. Results: 108 patients satisfied the inclusion and exclusion criteria. Of these 37 patients (35%) were male and 71 patients (65%) were female. Of the 108 study subjects, 54 patients (50%) were found to have an inadequate abdominal LES length, while 54 patients (50%) had an adequate abdominal LES length. Patients with an inadequate abdominal LES length (mean – 55.4 years) were older (p=0.028) than those with a normal abdominal LES length (mean – 49.2 years). They also had a shorter overall LES length (mean – 2cm) when compared to patients with a normal abdominal LES length (3.1cm). The basal LES pressure was significantly lower (p<0.001) in patients with an inadequate abdominal LES sphincter length. Compared to patients with adequate intra-abdominal LES length, patients with an inadequate abdominal LES length had a higher (p=0.017) DeMeester score (mean – 36.9 vs. 28.8), higher (p=0.006) percentage of time the total pH<4 (mean – 9.7% vs.7.3%), higher (p=0.015) percentage of time the upright pH<4 (mean – 10.8% vs. 7.5%). There was no difference between the groups in terms of transition zone, distal contractile integral, contractile front velocity, hypocontractile or absent waves, liquid and viscous bolus transit. When patients were categorized as either having or not having an adequate overall LES sphincter length, there was no significant difference between the groups in terms of basal LES pressure and 24 hr ph study results. Conclusion: Inadequate abdominal LES length appears to be a better predictor than overall LES length in the indentification of patients who are at greater risk for Gastro esophageal reflux disease.